Our team is looking forward to welcoming you to our hotel located in the heart of Amersfoort. The Central train station and City Centre are just within a 10-minute walk. Visit the hotel restaurant or bar for a nice view of Amersfoort. The 4-star Mercure Hotel Amersfoort Centre is 550 yds (500 m) from Amersfoort central train station, opposite the HU University of Applied Sciences Utrecht, and is the ideal place for meetings. Relax in our comfortable hotel with free WIFI at the heart of Amersfoort. Enjoy the atmosphere of our "Timeless" bar, where you can enjoy a fantastic view of the city while sipping a glass of fine wine or savoring a delicious lunch or dinner. Amersfoort has monuments, canals and museums as well as boutiques, restaurants and modern architecture. With the Koppelpoort gate, the Onze-Lieve-Vrouwetoren church, the zoo and the Kunsthal KAdE gallery, the city has something for everyone. 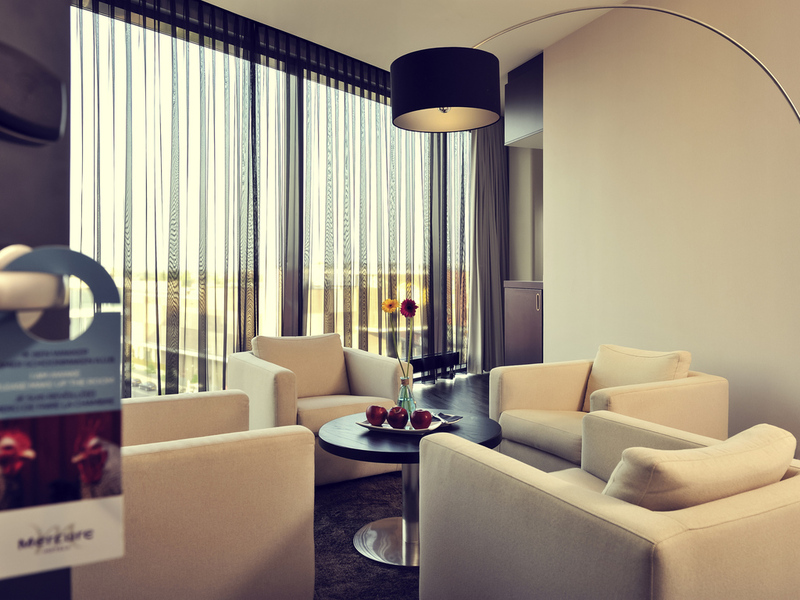 The modern rooms at the Mercure Hotel Amersfoort Center feature luxury bathrooms with a rainshower, as well as a 42" flat-screen TV, an extra-large desk, a comfortable recliner, wonderful beds and amazing views. The large suites are luxuriously furnished with a comfortable lounge suite, extra-large flat-screen TVs in both the sleeping and living areas, a whirlpool bath and a large dining/meeting table. Our Presidential Suites offer phenomenal views of the city. The restaurant offers a great choice of international dishes ranging from French and Italian to Asian and American cuisine. All dishes are prepared in the restaurant by professional cooks, and live cooking takes place at all meal times. The "TIMELESS" bar is a well-known meeting point in Amersfoort, offering a wide range of international drinks. During the day we serve a wide selection of pastries and an extensive range of coffees and teas. A separate smoking area is available.